Has been sat for a couple of year since it was last used so will need some work to get her up and going again but it shouldn’t take to much. Comes with 65hp mercury engine that was stored with fogging oil in carbs and pistons after the last use but hasn’t been started since then it turns over by hand and still feels like it has good compression. There is controls for the engine but it seems to jam in reverse which is something to do with the control box as the engine selects gears fine when the cable is removed. Comes with fuel tank and battery box but there is fuel line or battery. Steering was new in 2016 which still moves freely like new, also had new gear and throttle cables fitted at the same time. 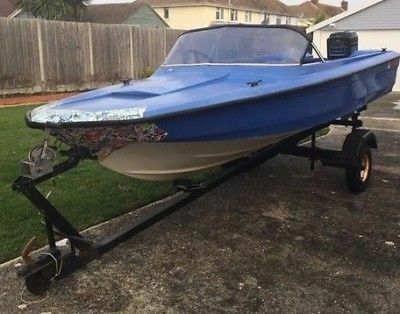 Trailer does work and was used to tow the boat around 4 miles to the launching spot each time but if it’s being towed any distance i would recommend taking it away on a flat bead trailer as the bearings haven’t been changed for some time. I know this as i haven’t changed them in the time we’ve had it and previous owner didn’t know when they were done last when he owned it.